Three class 1012 6400 kW Bo'-Bo' electrics were built by SGP in 1993 as prototypes for a new generation of electric locomotives with three phase AC drive. 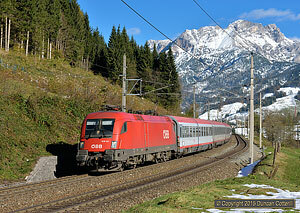 In the event, ÖBB opted for the Siemens Taurus design and class 1012 didn't go into series production. The three prototypes were used on Ro-La trains over the Brenner pass until 2006 and were then sold to Swedish operator Hector Rail. 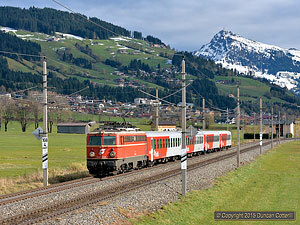 The most common locomotives in Austria these days are Siemens Taurus electrics of classes 1016, 1116 and 1216, equipped to operate on 15kV, 15/25kV and 15/25/3kV systems respectively. 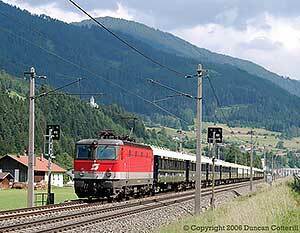 ÖBB has around 380 in total and locos belonging to independents and neighbouring countries can regularly be seen on Austrian territory. 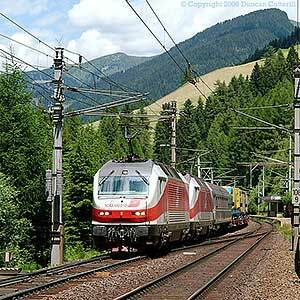 They can be seen everywhere on everything from local passengers to long distance expresses and all manner of freights. The ÖBB Class 1042 electrics were first introduced in 1963 with a total of 257 being built before production ceased in 1977. Class 1142 consists of locos equipped with push-pull equipment. For many years they were the standard Austrian electric loco and could be seen on passengers and freights all over the system. Most have now been withdrawn but a few remain in service, mainly on local passengers. Production of the thyristor controlled class 1044 started in 1976 with 217 built by 1995. Apart from the two prototypes, all were later equipped for push-pull operation and reclassified as class 1144. Most are still in service and can be seen all over the network on secondary passengers and freights.